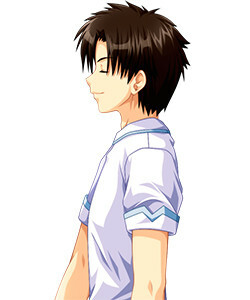 Kenichi is the protagonist of Sharin no Kuni. Despite being the youngest person to ever become a Special High Class Individual cadet, he has already distinguished himself as a CEO and a combatant in the Southern Country's foreign legion. Often considered slightly unhinged from the latter experience, he has a habit of talking to himself and making jokes other people rarely find funny. Despite his arrogant exterior, he has a strong sense of justice, which often clashes with the values of the country he serves. Being an SHCI candidate, Kenichi is a multitalented genius who is highly skilled in many areas such as Small Arms combat, Martial Arts, Business and Moneymaking, and even Spelunking, and possesses near-superhuman endurance and a charisma which endears him to nearly all whom he meets. He also has a habit of breaking the fourth wall when speaking to himself, referring to "you" <hidden by spoiler settings> , but in reality he is actually speaking with his sister Higuchi Ririko.